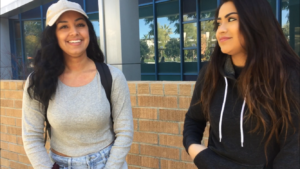 California Catholic reporter Mary Rose visits a California college each week and ask students about God, good, and evil. This story will be continued this afternoon. What did it mean to be religious when your grandma was alive? Liliana: Since I’m Catholic, it would be going to church out of respect for her, taking her to church. And I remember as a kid going every Sunday to church. Making sure that I’m doing my First Communion, I get baptized, just the typical Catholic stuff. Do you still consider yourself Catholic? Liliana: Well, I consider myself Catholic but I’m open up to anybody, any religion. I hear her, she says she’s spiritual. I have some [friends] that are Muslim and they invite me to their church, Christianity, and I’m just open to anything. I don’t really consider myself religious. You say you’re “spiritual” – what does that mean? Janessa: For me, it’s more like I embrace certain aspects of life. I like aspects from Buddhism. There’s certain things that I agree with and I take that and I like put that into my life. Liliana: Yeah, I kind of believe in what goes around, comes around. Janessa: Like mindfulness. Things like that. That’s my lifestyle and I believe in it. Liliana: Like do good and good will come back to you. Janessa: Exactly. Like good karma, things like that. Liliana: And I believe that God is everywhere. That’s just my opinion. Obviously everyone has different opinions, but would you say that some things are true and some things are not true? Janessa: I think that’s kind of hard to say because I think that like miracles happen and I’ve seen evil so I believe there’s a good. I haven’t seen good, but I’ve experienced good. You said that you’ve adopted only some aspects of Buddhism and you agree that the story of where Buddhism came from is not factual – does that mean some parts are not true? Janessa: I don’t believe it’s not true. I think it’s also how you’re socialized. I was raised Catholic, too, so I grew up with believing in Jesus Christ and I believe in God. So that’s just what I was socialized to. We’re a new generation so we read, we go to school, we’re educated. We get to learn these other religions and it inspires us, also. Things that we weren’t socialized to when young, now we’re acquiring this new information that we didn’t know. Buddhism, we didn’t know about mindfulness, we didn’t know about this, and it’s like oh, wow, it’s amazing. You say you were raised Catholic – what changed? Janessa: Honestly, getting an education and going to school. Cause my family, they’re first generation and they didn’t have a college education so I wasn’t able to acquire that from them. I had to learn on my own. And reading all these different books, I just read Buddhism is Real and it changed my mind on a lot of – opened my mind on a lot of things about religion.